How is it that a team that finished 9-9 in the regular season, 8th overall in the ACC, is in its first Sweet 16 since 2011? Call it determination. Call it grit. Call it talent. Call it sheer luck. Whichever way you spin it, the Florida State Seminoles have an opportunity to go for the National Championship this year. Each game is its own battle, but with only 3 games left before the National Championship, the Noles can make it through. Does it make them a sure bet? I wouldn’t say so. But March Madness betting lines payout higher for the less sure bets anyhow. The Noles have a talented squad with multiple impact players. Phil Cofer leads all scorers averaging 13.0 points a game. He’s followed by Braian Angola-Rodas (12.8), Terance Mann (12.7) and CJ Walker (8.1). The same standings apply to total rebounds. Coach Leonard Hamilton instilled a strong sense of confidence in his squad before departing for the tournament. In the first round, FSU took on the #8 Missouri Tigers. The game started out on an even keel, but the Noles began to run away with things in the first half. They had a 22-point lead at the break. Missouri tried to rally back in the second half, but FSU stepped up their defense to keep things at a comfortable distance to close out the game. Cofer had a strong game, but it was Trent Forest, Mfiondu Kabengele and PJ Savoy that stood out. The second round saw FSU up against the top-seeded Xavier. Xavier had the lead throughout the first half, but the Seminoles refused to go away. The Musketeers led 34-32 at halftime. Things began to get away from FSU in the second and their season looked to be in jeopardy down 9 points with 5:35 left. Then, in the final 5 minutes, FSU began executing on both sides of the floor. They were knocking down shots, driving into the lane and forcing turnovers and missed shots for Xavier. Savoy had another strong performance including clutch free throws at the end of the game. CJ Walker finished it with 2 more free throws a little later to put the Noles up 5 and out of reach of any Xavier miracle. Angola led all scorers with 15, through Trent Forest, Savoy, Cofer, Mann and Kabengele were not far behind. The win against Xavier was truly something to behold and shattered even more brackets. After the game, Coach Hamilton was proud of the effort being put forth by his team. “I thought our guys were dialed in tonight. They were connected. They were communicating. They were emotional throughout the whole game. They never doubted we could win this game,” said Hamilton. That composure and trust will be huge factors heading into their Sweet 16 matchup against Gonzaga. To their advantage, this is not the same Gonzaga team that played in last year’s final. This Gonzaga came in #4 and had a close win against UNCG and a blowout against Ohio State. The second round game should be more of a concern to FSU, as Gonzaga put up 90 points on the Buckeyes. Gonzaga may have more weapons, but FSU is coming with a lot of confidence. They also have a deep bench that contributes on both sides of the floor, though mainly defensively. Hamilton is known to throw in a full-court press in games, something Gonzaga often do, so expect these 2 teams to be going at it in the next round. Under Coach Hamilton, the Seminoles have made it to the NCAA Tournament 6 times in 16 seasons. He has winning experience as an assistant coach in Kentucky (3 Final Four appearances and a national championship) and hopes to bring that culture to this team. 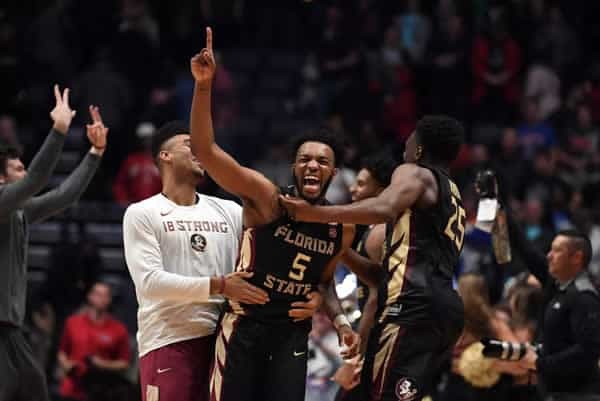 If FSU knocks off Gonzaga, they’ll play either Michigan or Texas A&M in the Elite 8. Texas A&M will be the tougher game, but also a chance at redemption since FSU’s former football coach Jimbo Fisher switched over to the Aggies in an ugly transition this offseason. If they win that game, they’ll likely face either Duke or Kansas in the Final Four. They’ve won and lost a game against Duke this season, so that matchup would be particularly interesting. The Noles have a winning culture in several different sports categories. Their basketball program hasn’t achieved much as of late, but this team looks poised and ready to make an impact. Coach Hamilton firmly believes in his players and that confidence translates to their play on the court. Gonzaga is a tough opponent, but if the Noles can remain cohesive and keep them at bay, expect them in the next round. If you are still placing bets on the tournament, you can see the latest odds for the Sweet Sixteen in real time at several US friendly legal online sportsbooks.